COLUMBUS (AP) — Democrat Richard Cordray has been barraging his Republican opponent in Ohio’s governor’s race as someone who wants to end health insurance protections for people with pre-existing conditions. 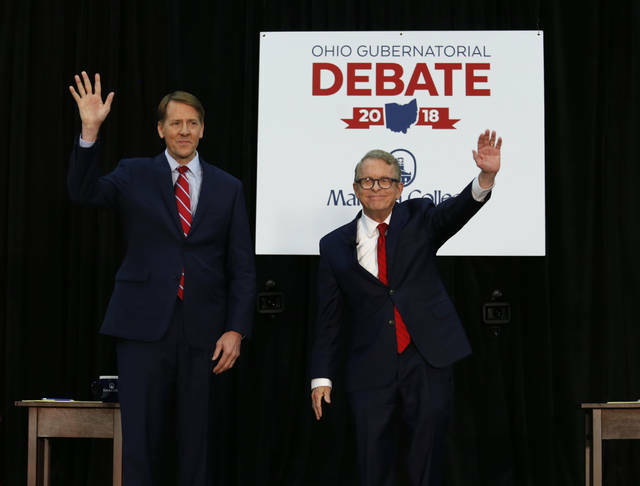 Republican Attorney General Mike DeWine, his rival, has reached back nearly a quarter-century, to a U.S. Senate debate from 1994, to defend himself. That’s despite DeWine joining a Republican lawsuit against the Affordable Care Act on his first day in office as Ohio’s lawyer in 2011. It’s a playbook that’s unfolding in U.S. Senate and governor’s races across the country, where Democrats are trying to make inroads against Republican rivals who now support certain popular elements of the federal health care law after opposing the overall law, commonly called Obamacare, in past elections. DeWine joins GOP gubernatorial candidates in Connecticut, Georgia, Michigan Rhode Island and Wisconsin who now say they support the law’s coverage protections for those with pre-existing conditions, for instance. Their efforts to downplay opposition to the federal law accompany polling that shows health care is a top issue among voters this year. During their Oct. 8 debate in Cleveland, DeWine and Cordray, the former federal consumer watchdog, clashed on the issue. DeWine called Cordray’s ads on the subject misleading. Besides the 1994 Senate debate , DeWine notes that he voted seven times in support of various bills that provided coverage protections for those with pre-existing conditions between 1989 and 2006 while he was in Congress. Cordray contends that his ads are accurate because all those votes are now irrelevant. During Ohio’s primary, DeWine positioned himself as a staunch opponent of the entire law, including the Medicaid expansion provision stridently supported by Ohio Gov. John Kasich, a fellow Republican. After DeWine won the GOP nod, in fact, Kasich threatened to withhold his endorsement over it. DeWine responded initially by saying the expansion was financially unsustainable. Eventually, under pressure from Kasich, doctors and others, he said he would support keeping the expansion — but with improvements.